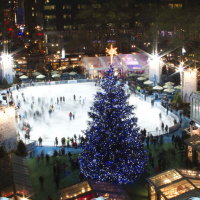 People of all ages will love these ice skating parties in NY. What could be more fun than beating the heat on a hot summer day with a few laps around the rink, or bundling up in the middle of winter for some frozen fun? Look through this list to find the best ice skating parties in New York. This additional guide also features ice skating party places in NY for your kid’s next birthday. An Affordable & Fun Ice Skating Rink in NY! A kid-friendly ice skating rink that hosts many kids' ice skating parties in NY, Hommocks Park Ice Rink is a perfect party location! Throw your son or daughter an NY ice skating party that they will never forget here. The birthday party package includes admission and a delicious meal of either pizza or a hot dog. Rent out a private party room for a more personal party environment. 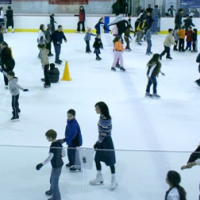 Only a half hour outside of Bronx, Hommocks Park Ice Rink is a great place to hold your kid's next ice skating themed party in NY! Everything is Provided Here in NY! Enjoy an awesome NY ice skating party at Aviator Sports & Events Center. Offering numerous party services, Aviator is happy to help you provide everything you need for your kid's ice skating party in NY, including invitations, party favors, food, beverages, paper goods, decorations, and more. The ice skating party package includes one hour of skating during public skating hours and one hour in a private party room. Book your kid's next birthday party at Aviator and host an unforgettable event! The Kids will Love Pizza & Ice Skating in NY! 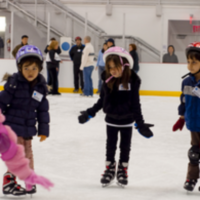 As a top skating party venue in NY, City Ice Pavilion offers a variety of options when throwing your kid's next birthday party. Have a private party and choose between one of the many NY ice skating party packages. Included in the packages is admission, pizza or hot dogs, drinks, a private locker room, invitations, and more. The children can even have the option of taking a group half hour skating lesson for up to 12 people! Book your kids next birthday party at this skating party place in NY today. Kid & Teen Birthday Party Packages in NY! Take your kid's next NY ice skating birthday party to a whole new level - have it at Wollman Park with the breath-taking Manhattan skyline as the back drop. No matter how many guests you want to invite, Wollman will take care of all your needs and wants, setting you up with either an exclusive or non-exclusive party on their arena. You even have the option of renting out their rink-side heated tent that seats 60 guests. The party packages include delicious food, servers, paper goods, balloons, party favors, skate rentals and more! Rent a Heated Party Room in NY! 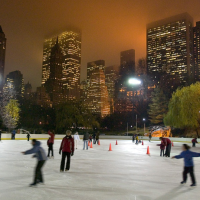 When throwing your kid a ice skating party in NY, consider one of the city's top places, Citi Pond at Bryant Park. You can make group reservations, rent out their cool party room, and enjoy a private 17,000 square foot skating rink. The heated party room that the party can head to after skating is decorated with a Winter Wonderland theme. With a variety of party packages, Citi Pond at Bryant Park offers two hours in the party room, balloons, skate rentals, and food and drinks. Whether you're looking to feed your guests with yummy cupcakes and hot chocolate, or pizza and soda, the choice is yours! Ice Skating Lessons Offered Here in NY! 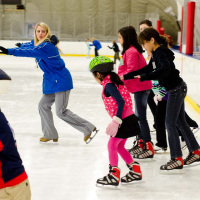 Not only does World Ice Arena offer fun ice skating for an hour and a half, and a catered party room, but they also offer lessons for up to twelve children! You can get all your NY ice skating party needs here, including a private party locker room, a choice of pizza or a hot dog, party favors, and more. With all the cool stuff included in World Ice Arena's various party packages, your kids ice skating party in NY will definitely be a hit! Book your party today! They will Take Care of all the Planning in NY! 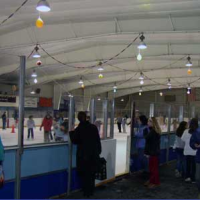 The friendly party planning staff at Staten Island Skating Pavilion will do all the work for your kid's next ice skating party in NY! Choose between one of the two party packages that include everything that you will need to make your kid's party fun and memorable. The party will be two hours long during public skating times. The party packages offered here include admission, invitation, paper goods, a hostess, pizza, beverages, a cupcake, balloons, and more. 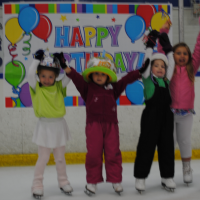 Book your kid's next party at Staten Island Skating Pavilion - your kid will love it! A Fun Party at a Low Cost in NY! For a low price, you can get endless skating with rentals, and a private party room and tables for your kid's next ice skating party in NY! Clifton Park Ice Arena will work with you in planning your son or daughters next party, and will assist you with all your party accommodations. 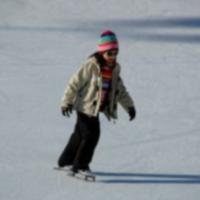 Having your kid's next NY ice skating party at Clifton Park Ice Arena is a perfect birthday idea at an affordable price. Reserve the party room now and have a blast!